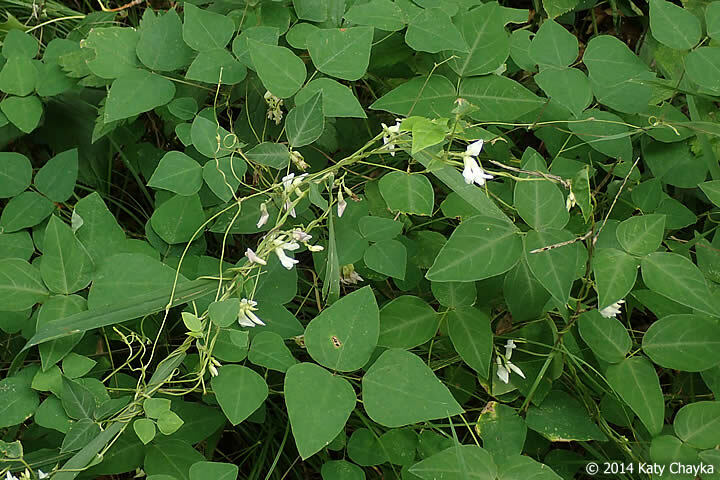 Amphicarpaea bracteata (American hog-peanut) plant. © 2014 Katy Chayka. Minnesota Wildflowers. minnesotawildflower.info (Accessed 8/2017). Amphicarpaea bracteata is an annual, twining vine to 1.5 m long, stems very slender, hairy. Leaves alternate, stalks long, hairy, blade 3-parted, leaflets 2-6 cm long, egg-shaped to rhombic, base broadly rounded. Amphicarpaea bracteata flowers. By Arthur Haines. Copyright © 2017. New England Wild Flower Society. gobotany.newenglandwild.org (Accessed 8/2017). 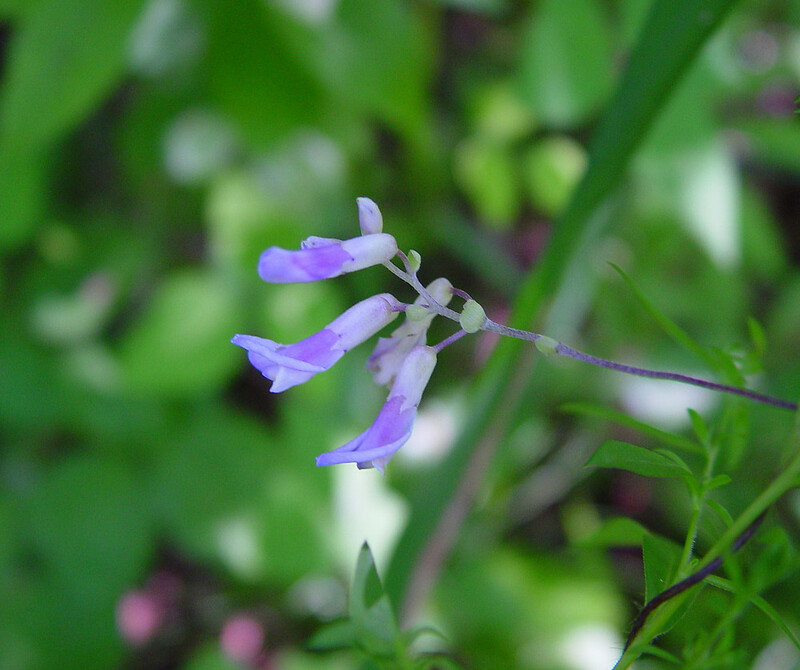 Flowers of two types: upper flowers are pale purple to white, bilaterally symmetrical, pea-flower-shaped, to1.5 cm long, upper petal (standard) rounded at tip, narrowed at base, 5 side petals (wings) and lower petal (keel) shorter, bases of all three very narrow and longer than expanded upper part (blade); calyx tubular to 0.5 cm long, with 4 short, pointed lobes; stamens 10 in two dense clusters (diadelphous) upper inflorescences of unbranched, axillary clusters (racemes) 2-15 flowered; second type of flower is without petals (apetalous) and not opening, on long thin stems at base of plant; blooms Aug., Sept.
Amphicarpaea bracteata (American hog-peanut) fruit. © 2007 Katy Chayka. Minnesota Wildflowers. minnesotawildflowers.info (Accessed 8/2017). Fruit of upper flowers becoming dry, pod to 4 cm long, curved, pointed at both ends, 3-4 seeded; fruit of basal flowers 1.5 cm long, fleshy, pear-shaped, 1-seeded, usually developing underground; fruit (legumes) matures Sept., Oct. (Fern 2004). Notes: Seeds eaten by some game birds and small mammals (Martin et al. 1951). 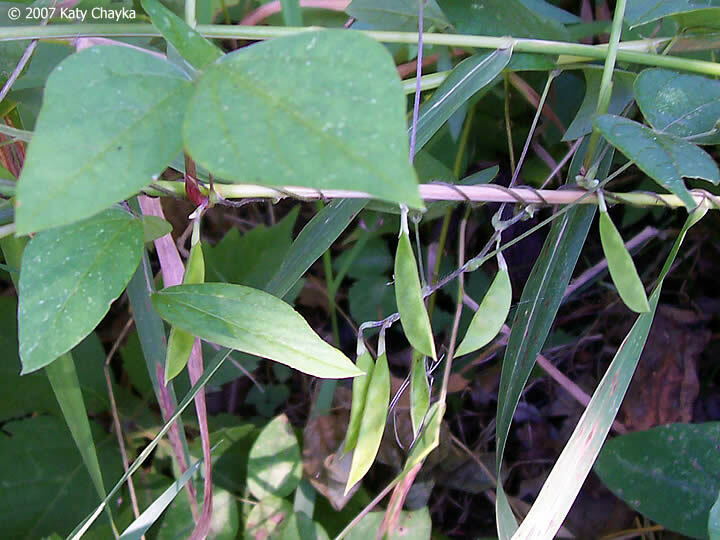 Seeds of upper legumes are edible if cooked; seeds of basal fruit are edible raw or cooked (Fern 2004).